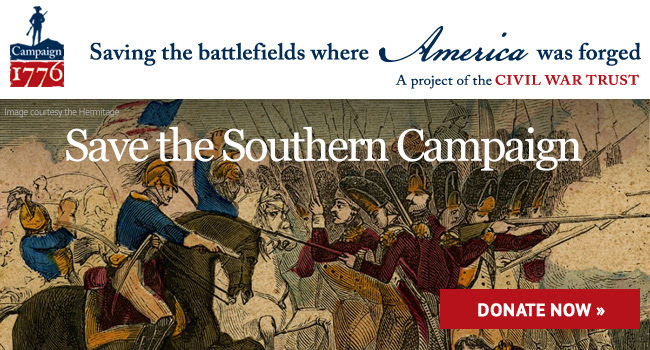 10mm Wargaming: Save Southern Campaign Battlefields from the American Revolution! Save Southern Campaign Battlefields from the American Revolution! Campaign 1776 is committed to preserving these battlegrounds and once saved interpreting the momentous events that occurred on these hallowed fields. Every day, people like you and I drive past these places oblivious to the struggles that raged there. By saving these battlefields, we can use these sites to tell this story of the American Revolution the way it deserves to be told. Thanks to an incredible set of matching funds, every dollar you donate will be multiplied by a factor of 37 for a $37.57-to-$1 match. Take advantage of this opportunity to make your preservation dollar go even farther.